As much as the Internet can provide a wealth of valuable information about any given topic it can also be a minefield for false or incorrect information. In the world of wild edibles I have sometimes seen a common name used for a plant that is incorrect; or the plant name may be correct but not in another geographical area. Many times common names are used specifically in one area. What makes an error of a totally incorrect name worse is when the Latin (or botanical) name is not provided. Bottom line, the tell tale way to properly identify a plant is by using its Latin name. When you’re researching edible wild plants always be sure that the website you are at is using Latin names as well as common names. I recently discovered something that I found disturbing at Livestrong while conducting some research. On its ‘about us’ page they say: “LIVESTRONG.COM offers authoritative expert content in the diet, nutrition, fitness, wellness and lifestyle categories that informs and empowers.” Now I have no idea if the writers are responsible for providing images for what they post or if Livestrong does this for them. I found an image that really disturbs me. 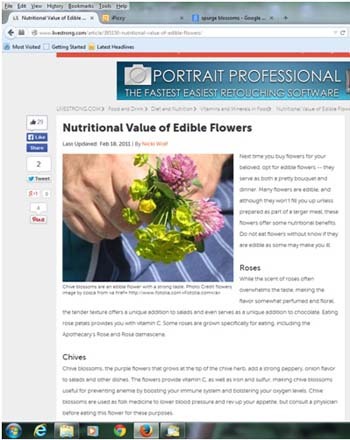 In my research I stumbled onto a February 2011 article titled “Nutritional Value of Edible Flowers”. The image that accompanies the article says it is chive blossoms. Wrong! Very wrong! The image depicts red clover flowers (which yes, are edible) and leafy spurge (Euphorbia esula). Spurge is not edible and can cause a host of health problems in people. In fact, leafy spurge is a very close relative of the poinsettia. Plants in the spurge genus contain milky sap which is toxic compounds that can cause skin irritation as well as eye trouble and supposedly, blindness in large enough doses. The sap is considered carcinogenic if it is handled a lot. So here we have an article about edible flowers and the image is clearly showing leafy spurge. When I see this I have to question the credibility of the content. The right thing to do is to let Livestrong know about this gross error, and I will. However, I took a screen shot of the page to show you just how critical it is that getting your information MUST come from a credible website. The Internet is a wild west and can be overwhelming when searching for credible and trustworthy information. Yes mistakes happen and of course I am sure Livestrong will change this when I bring it to their attention. However, this is an article that’s been out there for over three years and I truly hope no one found spurge and thought it was edible.